The following report from the "Stop Watching Us" demonstration in Washington, D.C., against NSA spying is reposted from the website of the Partnership for Civil Justice Fund. Saturday’s demonstration in Washington, D.C., was amazing! A big thank you to all the organizers, volunteers and supporters of the PCJF’s Thank You Ed Snowden campaign who helped bring the message into the streets of Washington, D.C., and into the living rooms of people around the country and the world through the coverage in the mass media. NBC’s national news coverage of the demonstration reached millions of people. The Today Show also covered the demonstration. Because of the widespread media coverage and visibility, many thousands of new people came to the website on Saturday and Sunday. They joined the campaign that is designed to show that, while the government is demonizing Mr. Snowden and hopes to send him to prison for the rest of his life, the American people thank him for his courageous action. We at the Partnership for Civil Justice believe that it is critical for there to be a growing public outcry and mobilization of public opinion to dismantle the surveillance state. The PCJF has been aggressively litigating in the courts in defense of civil liberties and civil rights, and exposing the government’s illegal domestic spying operations through our government transparency program. This work has produced huge breakthroughs during the past decade. But we also believe it is critically important to engage the American people in this battle whose outcome will determine the fate of the Constitution and our cherished rights to personal freedom and privacy. 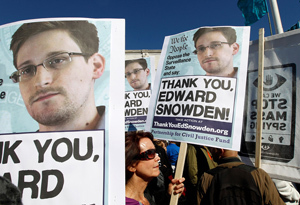 The Thank You Ed Snowden campaign is an essential vehicle for the mobilization of public support for Mr. Snowden and in uncompromising opposition to the surveillance state whose exististence he revealed to the general public.